The following article appeared in the January 2005 issue of ITS News from Durham University. We recently unearthed a short publication from 1968, which described the inauguration of N.U.M.A.C. The Northumbrian Universities Multiple Access Computer (N.U.M.A.C.) 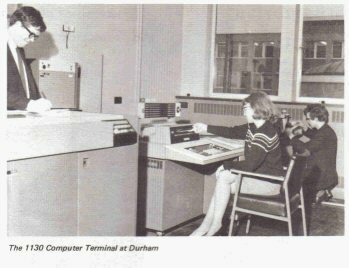 was the name given to a system installed to serve computing needs of the Universities of Durham and Newcastle upon Tyne. N.U.M.A.C. was hailed as the first computing system in the UK to be jointly owned and operated by two universities. Such co-operation enabled a much more powerful system to be made available than could have been purchased by either University acting alone. "The computer chosen was the IBM system 360, Model 67. Situated in the University of Newcastle upon Tyne Computing Laboratory are the central processor unit, the core store of 512 K bytes, a drum of 4 million bytes, a multiple disc unit capable of holding 233 million bytes available for access on eight replaceable discs, magnetic tape drives, appropriate selector and multiplexor channels controlling the flow of information and peripheral devices including printing, card and paper tape equipment and graph plotters. A small on-line satellite computer, the IBM 1130, also with printer, plotter, card and paper equipment, has been placed in Durham. Typewriter terminals have been installed in both Durham and Newcastle. A wide range of data preparation equipment for both cards and tape is available in both Universities.